Look at the image on the left. Can you draw it without lifting your pen/pencil and without tracing a line? 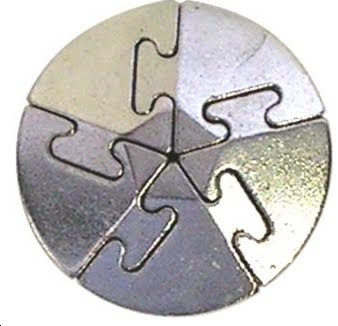 This was a very popular pencil puzzle for elementary school kids. Can you draw the same shape without crossing a line? Yes it's possible. If you can, take an introductory course in Topology. If you do, all of these puzzles become quite easy. 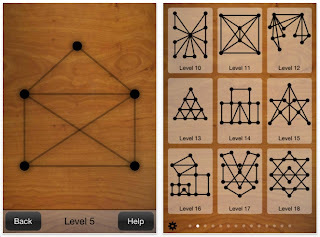 Drawesome is not the first puzzle app of this kind. But a good friend of mine really likes this. 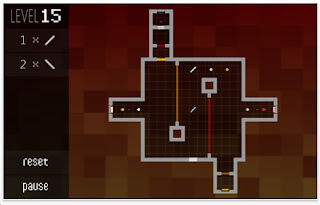 The first 16 levels are free. After that, there are 84 more levels for a nominal charge. Banzai Dice is a point scoring puzzle app. The object is to create strings of 4 consecutive numbers or 4 identical numbers to score points, and make those dice disappear from the grid. A string could be horizontal, vertical, in the shape of a square or even a zigzag pattern - but not diagonal. The left column indicates the next 6 dice to place onto the field. You may place the number in any column where a plunger will finalize the move. However, a 3 cannot go under a 3. If the board fills up, the game is over. The scoring system is what's most interesting about Banzai Dice. It's possible to get multiple strings at the same time and that's when the big points kick in. 10 strings = 1000 points. The scoring system leads to conflicting goals. On the one hand, you do not want the board to fill up. On the other hand, you will need to have the board partly filled to get the multiple strings. I've played Banzai Dice for the past few weeks. My high score is currently 3130. In that game, I had 13 strings, which was unexpected. I thought I was getting 5 or 6. It's difficult to see or plan the big picture. Sergey Epifanov, the developer, told me that he had 17 strings on one move, which yielded 2890 points just on that one move. 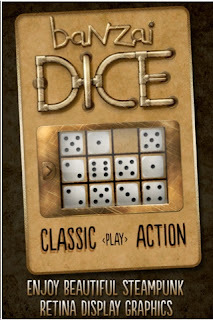 Banzai Dice is definitely worth your time. 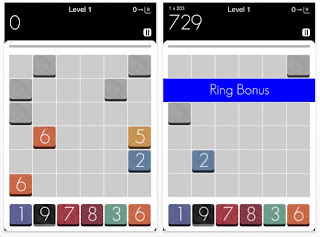 Especially if you liked playing Tripevo and NineOut, which are two other point scoring puzzle apps. 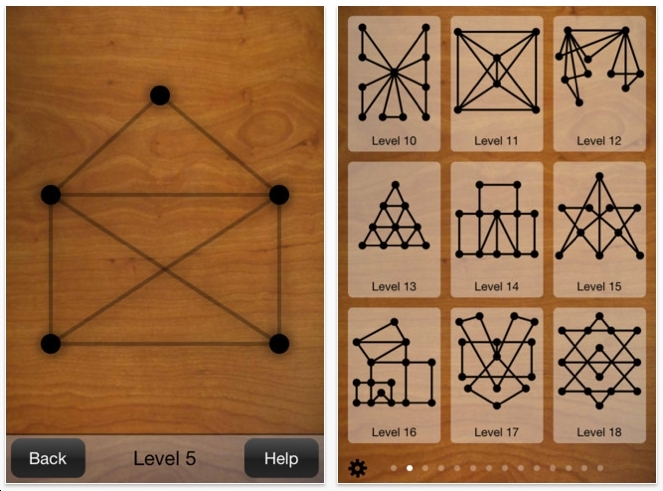 Will it make the list of 'Best Puzzle Apps of 2012'? Possibly. I have posted blurbs about NineOut a few times. You might say I've become obsessed with this little game. About 1 month ago, I was the world leader with 80,000 points. Then the developer overtook me. I leapfrogged him with 120,000 points. He reclaimed the lead with 130,000. After a couple of weeks, I finally overtook him! My high score is now 151,000. I need to stop playing it. I have 3 distinct strategies to play this game. But I'm not going to reveal them. 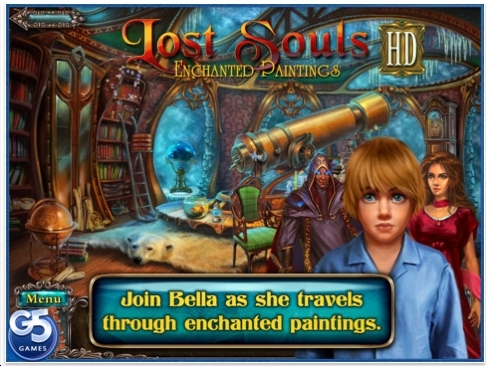 Click here to see the video of how the game works. This puzzle resembles a 4 piece puzzle that is shaped as a square. 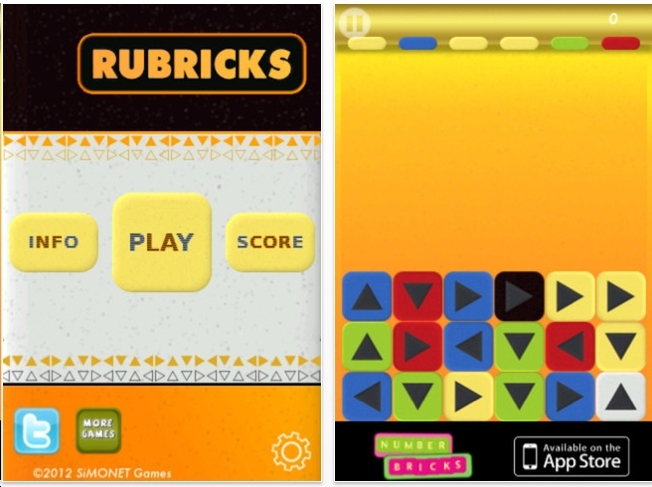 The old Binary Arts company, now known as ThinkFun, produced it. The idea is exactly the same: take it apart. He he. Actually I thought both versions weren't too hard. Surprisingly, guests give up. At the very least, get this for a teenager as a gift. 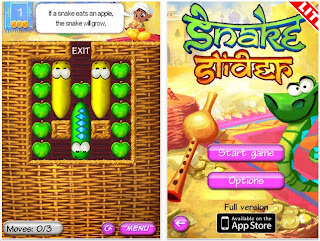 The object of Stoked is to eliminate all the bugs - in this case - with 3 taps. Tap on a red bug and it shoots 1 bullet in each direction. This leads to massive chain reactions. Only red bugs will fire bullets and disintegrate. 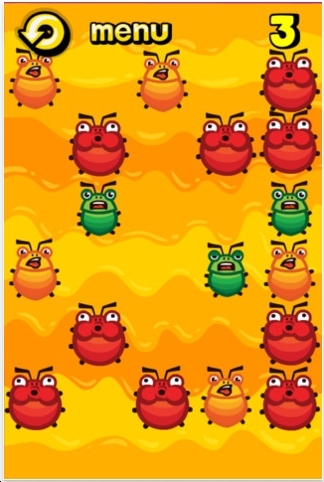 After an orange bug is hit once, it will turn into a red bug. 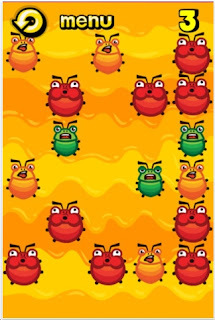 A green bug is 1 level higher than an orange bug and a blue bug is still 1 level higher. 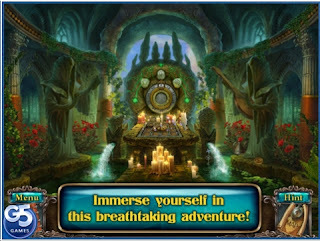 Stoked is identical to another puzzle called Shrooms which I review about 3 months ago. 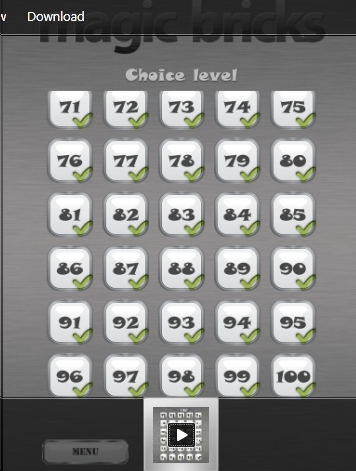 Stoked has 180 free levels (I've solved them all) and 600 paid levels. There are many free chess apps available. Do a search for cnvcs at the app store. This particular version has lots of bells & whistles. You can play chess at a variety of levels. Of particular note is the list of chess puzzles - some 38,000. 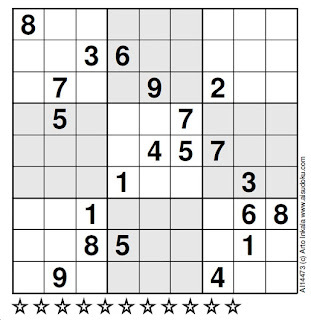 What would make them better: if each puzzle were classified. For example: Mate in 2. Another problem is that the player can make 12 silly wasteful moves and still achieve checkmate, which negates the true nature of the puzzle. 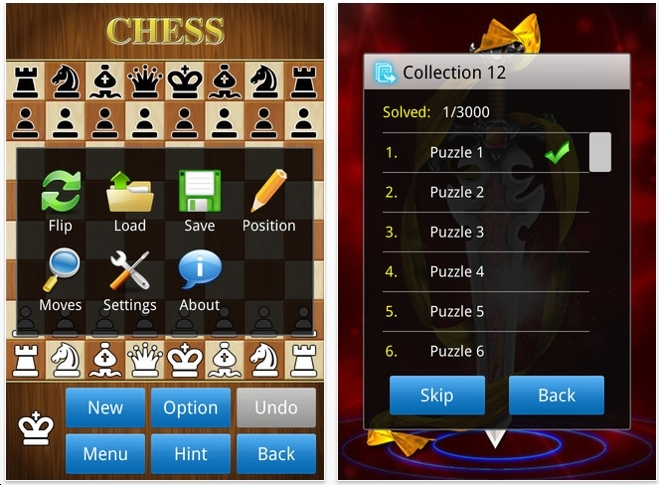 Guo Kuang is the author of this chess puzzle app. Here's what he said about my puzzle app blog: "Because of the Great Firewall of China, I can't visit the blogspot.com. What a pity!" I told him about my qualms and he said it's a good idea. 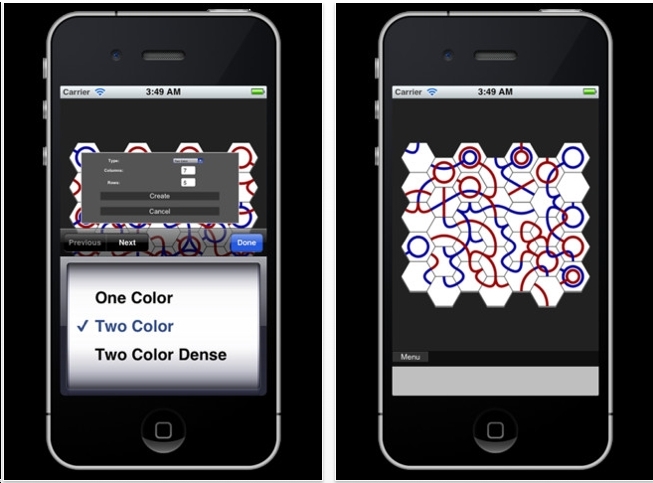 The object of Curvy Free is to rotate all of the tiles - in place - until all of the lines and colors match up. 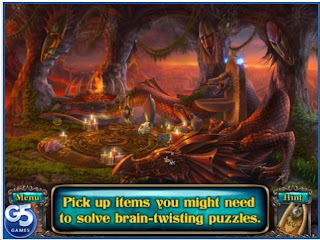 We've seen this type of puzzle app before, but usually with square tiles for plumbing or light bulbs. Tapping on a tile rotates it - a bit slowly. But still, it's fun. A kid would think this puzzle to be awesome. 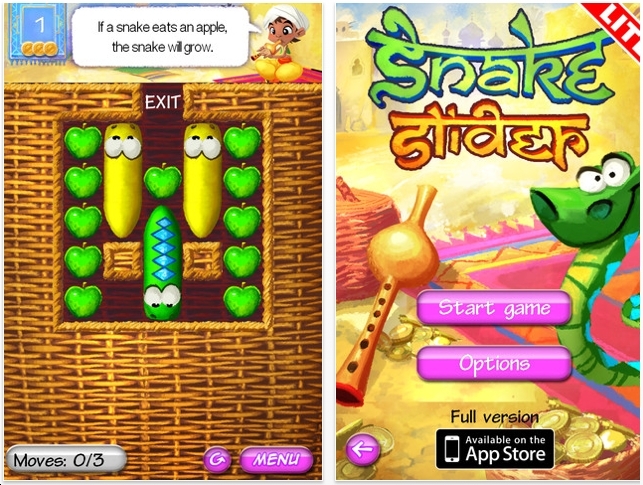 Unfortunately, it will not make the list of Best Puzzle Apps of 2012. The object of Slide Frog, a free puzzle app, is to slide rows and columns - not individual cells - to match the given pattern. We've seen this type of puzzle at least 10 times. But Slide Frog seems more fun. 100 levels. Not terribly hard. I've done about 40 levels. This blog now gets about 650 hits per day! 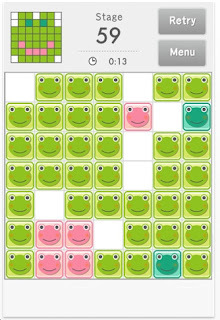 Also, if you google the phrase 'puzzle app', this site comes up #1. The itunes store comes up #2. Would you do me a favor? Please sign up as a follower. Oskar van Deventer created this take-apart puzzle. It's tough! 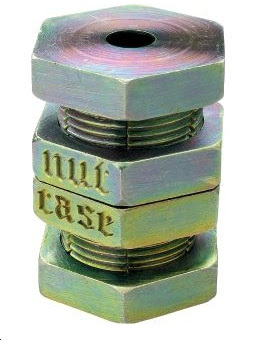 I spent hours twisting the nuts back and forth. One of my students brought the puzzle and asked: have you seen this? Yeah, and I can't solve it. Then he showed me. People sometimes ask me what types of puzzles I collect. That's hard to answer, but I always start with: Oskar's puzzles! The object of Brain Fit 2 is to assemble the pieces to fit into the light green rectangle at the top of the screen. The graphics and user interface are terrific. If you like this type of puzzle, go for it. The object of Frankenword is to use the given letters to find two words that blend into each other. 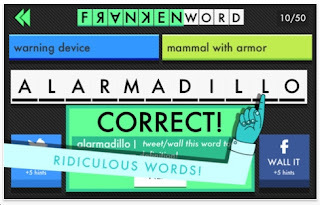 Frankenword is a free puzzle app. Well, the first 50 puzzles are free. After that, you gotta pay. I think it's fun. Another good word puzzle app is 7 Little Words. If you've got a favorite word puzzle app, let me know. The object of PathPix HD is to connect pairs of numbers with a line that will cover exactly that many squares. 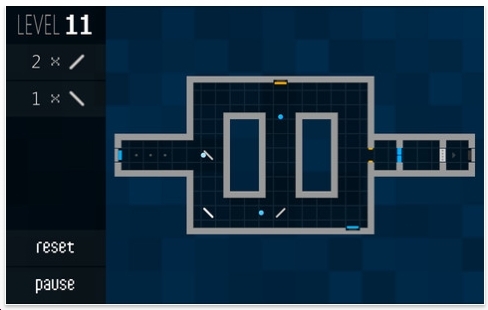 Look at the center of the image: the two 12's are connected with a big yellow S that's exactly 12 squares. 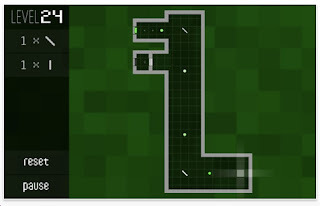 PathPix has about 200 levels. It's very well done. In terms of difficulty - not hard. Slightly tricky. Some of the grids are super large - but that doesn't mean they're any harder. 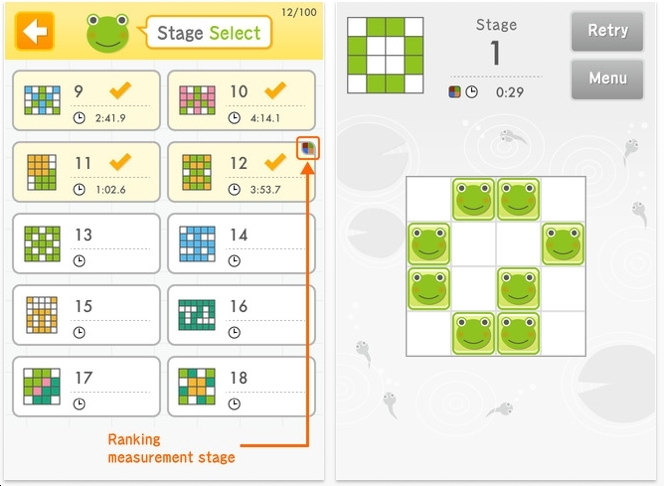 Young puzzlers will definitely like this. You really need a big screen for PathPix. Click here to Kris Pixton's web page. At the very least, download the lite version - it's free. The first few levels are quite simple. Then they get hard, very quickly. 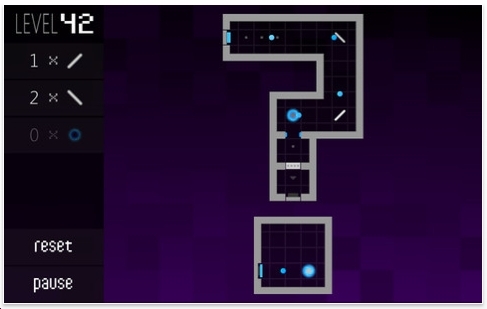 There are 40-some tutorial levels where you will learn about action blocks: inversion, mask, swap, shift etc. Suffice it to say, it's easier for me to direct you to view the video. 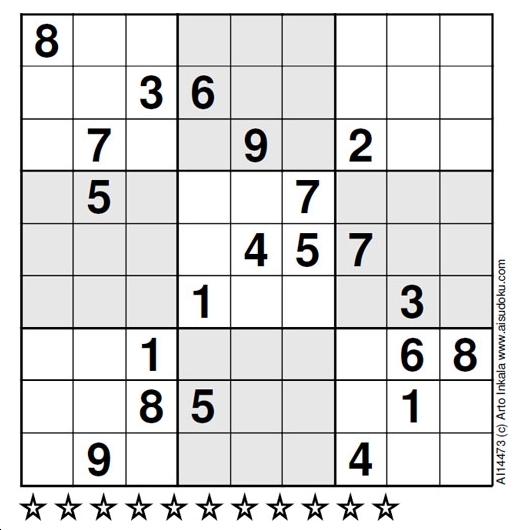 You might think that all the 3x3 grids are easy. No! 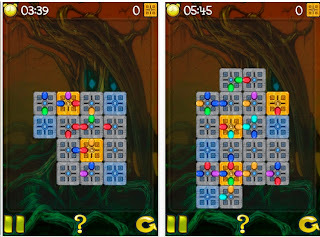 The 5x5 grids are multiple puzzles in one. Fuusio is tough. I cannot simply play this while 'watching' the news. Full concentration is required. Fuusio absolutely jumps onto the list of Best Puzzle Apps of 2012. 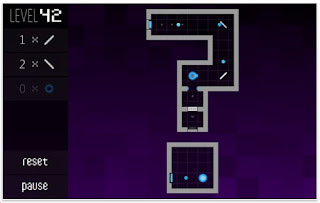 If you finish all the levels, please contact me. I first got this puzzle from Thinkfun. I believe they called it Twin Tangle. 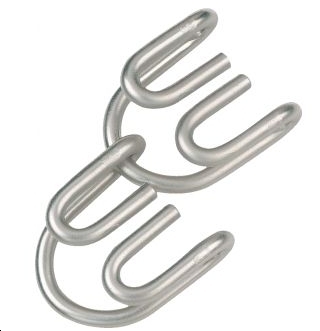 It's a disentanglement puzzle. What I particularly like about this puzzle is that you can give it to kids and they will not be able to break it! Oh! I remember Thinkfun had it in their discount bin, so I bought a few copies for $1 each. Get it. Let me know how you like it. Colbox: the object is to make all the tiles the same color. You start with your man being colored in the top corner. If an adjacent tile is green, then you can make your lone tile green - enabling you to absorb that other green tile. Each puzzle comes with a given number of moves. 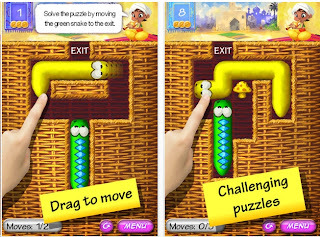 We've seen this type of puzzle app before. Floodit comes to mind. I like the artwork of the title! 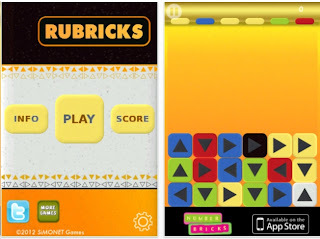 Previously, I wrote about Magic Bricks. 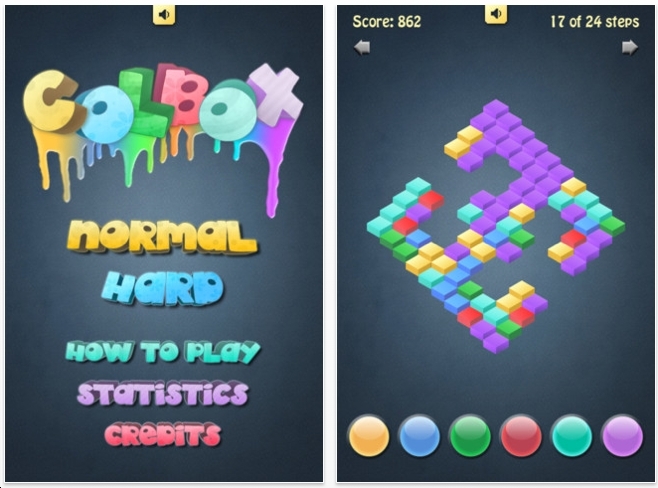 It's fabulous, incredibly addictive. But I'm royally pissed off. It shows that I've completed all of the highest levels. When I completed level 100, I knew that I had to go back and do level 33. That was the only level left for me. Level 33 took about 45 minutes to solve. Now look at the next image. 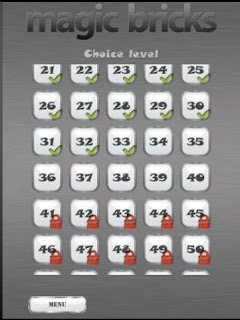 After I solved level 33, the program discarded my success on levels 34 - 100. I had to delete it from my ipad. So, if you do attempt to do this puzzle app: don't skip any levels! 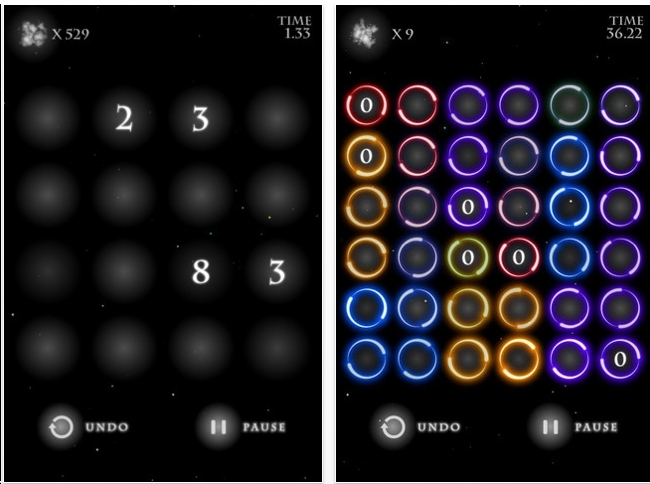 I've previously posted two mentions of NineOut, which is a point scoring puzzle app. 2 things you should know. 1. I regained the lead and am the high scorer with 120,000. In 2nd place is Sandro Bagattini with 100,000. He's the developer. Ha! 2. 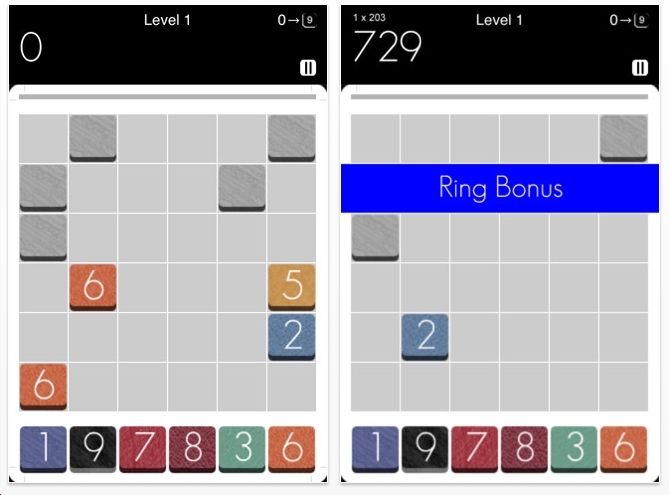 NineOut is free until July 15. That doesn't give you much time. Runeline is an edge-matching puzzle. 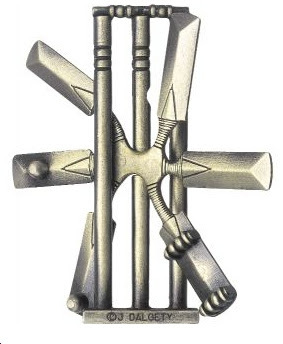 Grey Runes can rotate and move. Yellow Runes are fixed, but they can rotate. Blue Runes cannot move or rotate. See the Wikipedia article here. There are 48 levels. 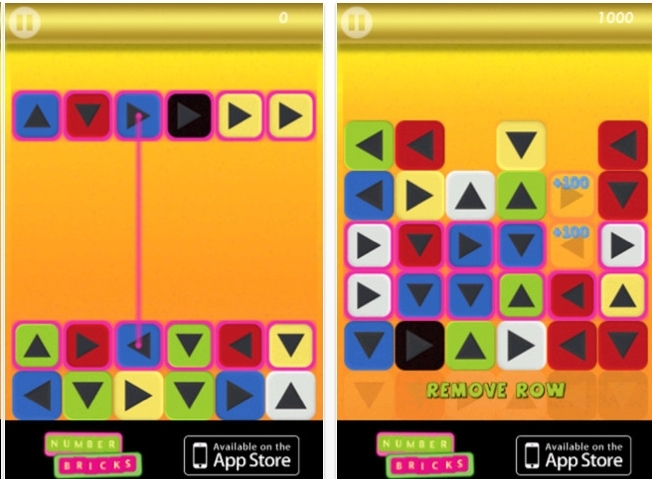 I've solved15 levels and am stuck on level 16 which has 22 tiles. Anatoliy Tsvetkov is the designer. 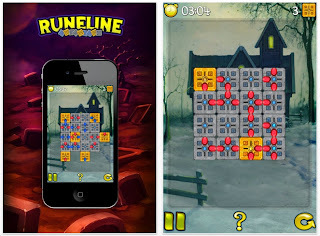 Runeline is a free puzzle app, so definitely give it a chance! In 1990 I bought 2 books of Sam Loyd's puzzles. This puzzle was in one of them. 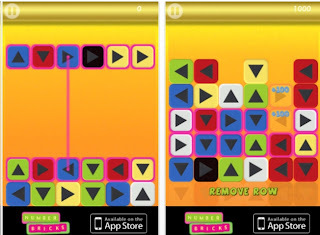 The object is to slide tiles 1 square at a time, or jump tiles one square at a time to interchange the colors. I remember spending a good 30 minutes looking for the fastest solution. 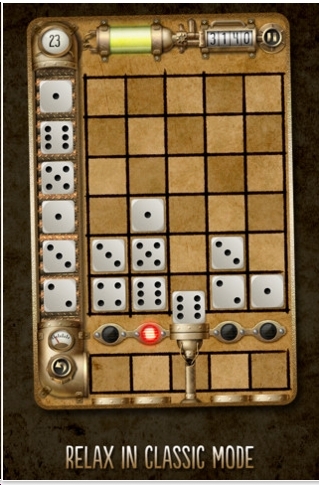 This version is free and, hey, you won't have to collect bottle caps to do this puzzle. James Dalgety, I believe, has the world's largest puzzle collection. He's from England and he designed this Cricket puzzle. I've played with this puzzle and have solved it. Also, I played the actual game Cricket when I worked at a summer camp with some of the counselors who were British. I didn't fully understand the rules. It's not as good as baseball. Sorry James! Bas de Reuver recently contacted me about an update to his puzzle app: Snake Slider. He's got 25 more levels. I've solved 23 of them. Those last 2 are killing me. 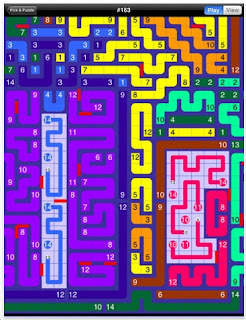 7/14/12 Update: I solved the last 2 levels. Oh yeah! The object of Number Zone is to fill the grid completely with groups of colored circles. 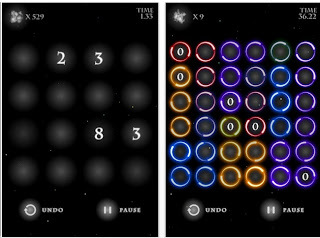 Look at the 2: that group will consist of 2 circles, while the 8 will yield in a group of 8 different colored circles. 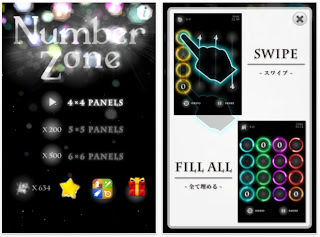 Number Zone is not terribly hard. 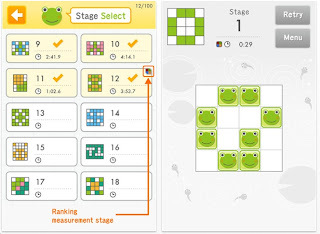 Grid sizes are 4x4, 5x5 and 6x6. I noticed that my standing on the Leader Board was low. So I kept playing the easy levels to advance and that's when I discovered that the game keeps repeating the same puzzle levels. Ugh. Still, it's free and it's fun. 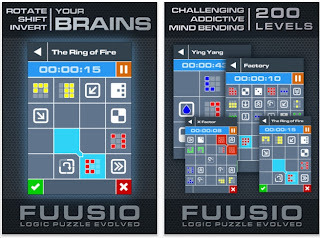 But it won't make the list of Best Puzzle Apps of 2012. 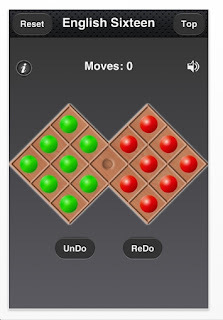 The title alone makes this puzzle app worthy of my attention. Worthy of your attention? That's another story. Blocks come down in rows all at once - actually quite slowly - and you have to line up same colored blocks with opposite arrows to eliminate them. I could describe 5 reasons why this game is awful. But I'd rather not spend any more time on this. 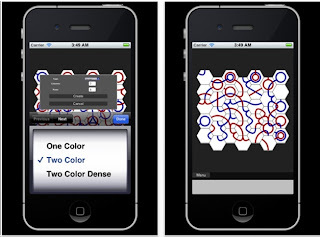 Micron is a mirror-maze puzzle app which requires an element of timing. Bullets are shot from the starting point. In the case above that starting point is the blue mark on the extreme left. The target is the grey target on the extreme right. 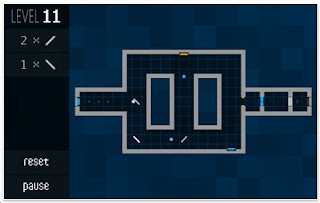 To open the blue gate on the right, one of the bullets must hit the blue mark at the bottom right corner first. Notice the colored lines? A red bullet can go through a red line and continue onward. The red bullet will cease to exist if it hits the orange line. Look at Level 24. 1 mirror is tilted, the other is vertical. I don't think I've seen that element in mirror mazes before. Micron has 51 levels. I have solved them all! They start easy, and get, seemingly, impossible. I found an alternate solution to level 40 that does not utilize all of the mirrors. Tom Voros, the author, has since fixed that in the latest upgrade. Micron has old-school 1980's graphics. But that's okay. 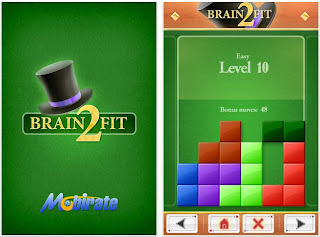 It's the challenge and fun of the puzzles that propels it into the list of Best Puzzle Apps of 2012. 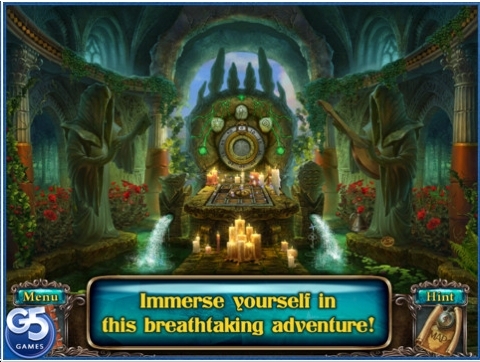 Arto Inkala has spent months making this puzzle. 11 stars. Nobody has solved it.